There's something deeply personal about one's beauty routine. Some have 10 steps in their process, while others stick to one or two. Some prefer face oil, while others choose moisturizer. Some mask their face, while others mask their hair (or some mask their face and hair). And some use a hair dryer, while others use ... two hair dryers? That latter group includes Bryce Harper, an All-Star slugger for the Washington Nationals and the proud owner of luscious hair. His older brother, Bryan Harper, also a professional baseball player, gave us all a peak behind the scenes of Bryce's beauty routine. As it turns out, the big secret to the MLB star's glorious, envious locks is just using two hair dryers. Who knew?! In the above clip, Bryan sneaks up on his brother while Bryce is styling his hair in the bathroom. Here's how we know Bryce really isn't messing around — he's using Dyson hair dryers, those fancy "dryers of the future" currently blowing everyone away. So there you have it, folks. The real way to up the ante on your hair game is just using even more hot wind. Bryce Harper has it all figured out. UPDATE: It turns out the video was a promotional stunt to market hair-care products. 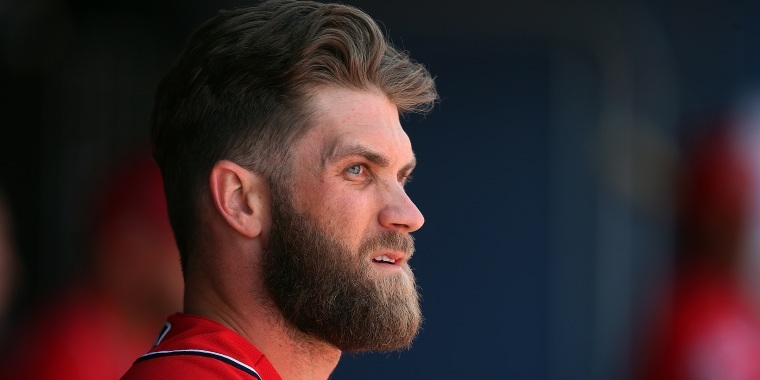 It doesn't change the fact that Harper has very nice hair. Is the new Dyson hair dryer a bunch of hot air?